Delta is kicking off the New Year with a 10 percent increase in peak-day seats at its Seattle hub for summer 2018. Driven by the addition of three new destinations as well as more flights and larger aircraft operating between existing routes. The new destinations include Washington-Dulles and Kansas City, which will launch June 8, and Indianapolis, which will launch June 18. Delta will offer one daily round-trip each to Washington Dulles International Airport, Kansas City International Airport, and Indianapolis International Airport. Washington-Dulles service will be operated using Boeing 737-800 aircraft, Kansas City service will be operated using E-175 aircraft, and Indianapolis service will be operated using Airbus A 319 aircraft. Based on more demand from Seattle customers, Delta will launch additional flights to Las Vegas, New York-JFK, Orlando and Medford during spring/summer 2018 and will expand its summer seasonal service to Cincinnati to year-round. Additionally, Delta will offer seasonal weekend service to New Orleans from Feb. 10 through March 31. The airline will also use larger aircraft to operate several existing routes, including Austin, Los Angeles, Milwaukee, Nashville, Phoenix and San Diego. Delta's significant growth in Seattle to start 2018 speaks to the strength of its Sea-Tac hub. The airline will operate 174 peak-day departures to 54 destinations in July 2018, an increase of 11 departures compared with summer 2017 and 96 departures over summer 2014. Delta's domestic seats will be up 112 percent over summer 2014, with 80 percent of Delta's domestic seats served from Seattle on mainline aircraft for summer 2018. Delta and its joint venture partners Aeromexico, Air France-KLM, Alitalia, Virgin Atlantic and WestJet serve 16 international destinations from Seattle, including Amsterdam, Beijing, Hong Kong, London-Heathrow, Paris, Seoul-Incheon, Shanghai, Tokyo-Narita, and eight destinations in Canada and Mexico. Air France will also begin direct Seattle-Paris service in March to complement Delta's existing service. In 2017, the airline added or expanded service to nine destinations, including Austin, Boston, Chicago, Eugene, Lihue, Milwaukee, Nashville, Raleigh and Redmond. Seattle is also Delta's primary gateway to Alaska with service to five destinations — Anchorage, Fairbanks, Juneau, Ketchikan and Sitka. Every Delta flight from Seattle features Delta One or First Class and Delta Comfort+ seating. Free entertainment is available via Delta Studio, and Wi-Fi is available on all long-haul international flights and nearly every domestic flight operating in the contiguous U.S. 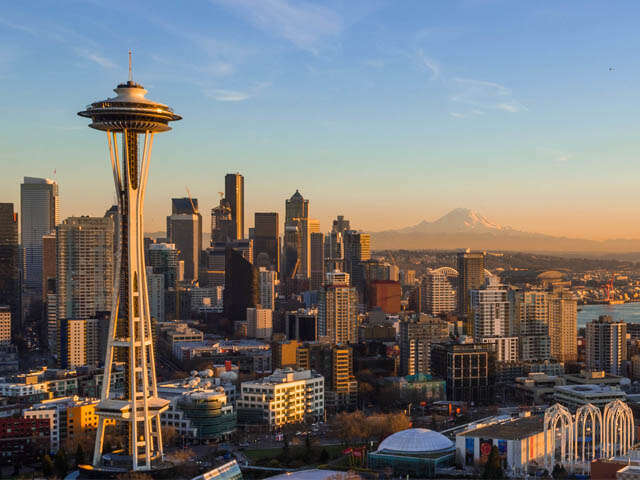 Select flights between Seattle and New York-JFK will operate using Delta One-equipped Boeing 757-200s with lie-flat seating in the front cabin beginning April 1.​ The airline opened a 21,000 sq. ft. Delta Sky Club — the third largest Sky Club in Delta's system — located between Concourses A and B in late 2016. In 2017, the Port of Seattle broke ground on a new international arrivals facility, of which Delta will be the largest user.